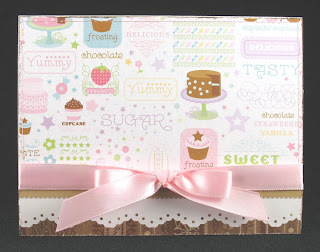 For this card made with the Cupcake set, I knew I wanted to use 3 of the cupcakes, but they wouldn't fit on a 1/4 sheet card, so I ended up making this long skinny thing that will fit in a business envelope. 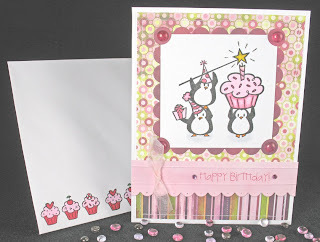 I wanted this card to be really soft and sparkly and girly to go with the Sweet as a Cupcake saying. All the patterned papers are from The Sweet Stack, and even though it does have pre-glittered papers in it, I actually did the glittering on the striped paper with some Stickles. For more glitz, I went over the lines on the tops of all the cupcakes, and also around the edges of the sentiment block with a Stardust glitter pen. Then to finish it off, I also added some lace, buttons tied with pink embroidery floss, and some satin ribbon. I *so* adore the Cup of Stuff set! Not only are the mice images too cute, but I love the funky pretty flowers in the other cup! For the first one, I did a bunch of cutting out and layering of different parts of the mice. Hopefully you can see it in the picture. I even stamped the tiny little mug on a bit of patterned paper from the same collection and popped it up with itty bitty hole punches. I used 2 different Stampin' Up! punches for the saying, which is from the Sentiments set. On the oval, I sponged ink around the edges, and then felt it was a little harsh, so I rolled the edges in glue and covered it with Angel Dust glitter. I think it softened up the color just a bit and I love the sparkle. I also love these Heidi Grace Jolly and Bright papers! As a last finishing touch, I decided to add the flower in the corner (what do you think?). It's a couple of silks from the craft store with a white brad for a center. For the second one, I did a couple extra layers so that the mouse would be popping out of the cup, but I did the dimension a little weird so it's really hard to see in the picture. Once again the XOXO is from the Sentiments set. The patterned paper is Creative Imaginations, the ribbon is May Arts, and the foam letters are Thickers. If the size seems a bit weird, it's because this card will fit in your standard bill envelope. And that concludes my Pink Poison Spotlight - hope you enjoyed all the cards! I'm hoping to have the new Anyas in my hands soon, so be on the lookout for more Pink Poison! I cannot tell you how excited I am to be Marie's guest on the Pink Poison blog today!!! I ended up making 6 cards for my guest spot, and I don't want this to be the longest blog post ever, so I'm splitting it up into 2 posts. I *adore* the Anya stamps because they're so cute and because they're so much fun for paper piecing and tole! I stamped Princess Anya onto white cardstock 3 times, and her dress portion onto 2 different patterned papers (the pink underneath is from The Luxury Stack by DCWV and the top is Two Scoops by Basic Grey). I colored her with my Copics and then proceeded to assemble - I popped up an extra face with bangs, and then just the bangs. You can see the dimension a little better in the close-up shot. Lastly I added the 2 dress pieces. For the wand and crown, I colored them (including the lines) with a Sakura Stardust glitter pen, and then added 2 different sizes of rhinestones to the crown. It kind of looks gold in the close shot, but it's actually silver. I punched a couple different sizes of circles from the Two Scoops papers, lightly tacked them onto the swirled background, and then sewed over them all with pink thread. 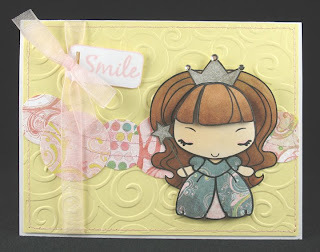 Then I stamped Smile from the Sentiments set on a Cuttlebug tag and attached with some organdy ribbon. I tried watercoloring before and wanted to play some more so I decided to use this gorgeous rose image from the Fancy Fleurs set. I was heavily influenced by Jerri Kay and Leslie Miller, specifically this post that I also followed for my last watercoloring attempt. I don't claim to have anywhere near their talent, but I'm still practicing! 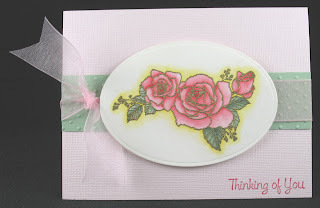 I stamped and embossed in detail gold embossing powder then watercolored with reinkers. I only used 3 colors - Rocket Red and Pearlescent Ivy Brilliance, and Barely Banana from Stampin' Up! Just like my last try at watercoloring, this took me forever so I didn't want to do to much with the rest of the card that would draw attention away from the roses. Just a little strip of embossed cardstock, some Stampin' Up! ribbon, and another saying from the Sentiments set, and I was done! I especially love the monkeys from the Best Mates set, so I made a card featuring one. You can probably tell that he's the topper for a paperclip bookmark, which is slipped into the little sewn pocket. I stamped him once on white cardstock and once directly onto the blue paper. I colored him with Copics on the white version and cut him out, leaving the tail out. I then glued him onto the blue piece. 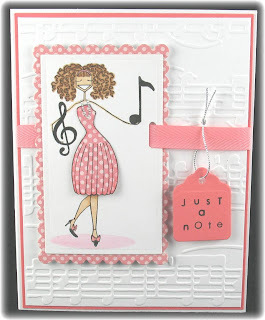 All the patterned paper is from Stampin' Up! 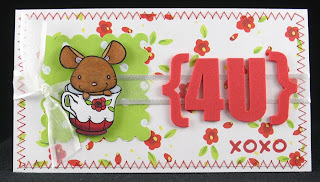 The saying is also from the Sentiments set and the velvet rick-rack is from May Arts. Please come back tomorrow to see the details for my other 3 cards! 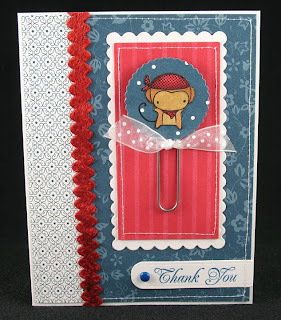 I'm calling this a scrappy card because it doesn't have any stamping on it at all. I just got The Sweet Stack from my local craft store (I've been wanting it forever) and I HAD to use this adorable pattern immediately! This card was super easy: You see that bottom piece that looks like I used a border punch on it? I didn't - that's part of another pattern in the stack! I just stuck the 2 different pieces together and hid the seam with the ribbon. 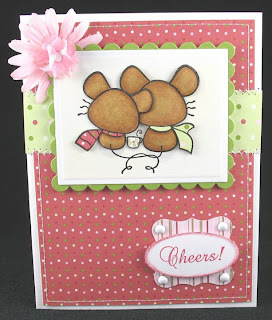 If I hadn't done the sewing and inking and distressing, this card would have taken me about a minute! Now I'm a little sad that they don't sell this paper individually because I'd make a whole set of these as a gift! 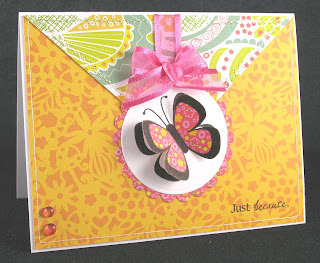 I created this card for the Verve Stamps' Celebrate Amy W Challenge which was to make a bright, cheerful, colorful card in honor of DT Diva Amy Westerman who will be leaving the team. I just picked up the K&Co. Berry Sweet paper pad at a local craft store yesterday and thought the funky bright prints would be perfect for this challenge! I also thought that the Fluttering By set would go nicely with the paper. I saw a card that looked like the back of an evelope while browsing through a Close To My Heart catalog and loved the look so I decided to try it. I really like how it turned out, so I will probably be doing more of them in the future. TFL! Other materials used: white cardstock - Georgia Pacific; ink - Graphite Black Brilliance; ribbon - May Arts; Dew Drops - The Robin's Nest; Nestabilities. Hubby reminded me yesterday that we have a first birthday party to go to tomorrow, so I grabbed the Smells Like Cake set from The Cat's Pajamas again and went to work. I picked this set because the theme is cupcakes and I think these penguins are just adorable! The image is colored with Copics and I added some Stickles to the star and sprinkles on the cupcake. I even stamped and colored the envelope too! Other materials used: white cardstock - Georgia Pacific; patterned paper - Basic Grey (Eva paper pad); Graphite Black Brilliance Ink - Tsukineko; organdy ribbon - Stampin' Up! ; Dew Drops - The Robin's Nest (Paris assortment); rhinestones - The Rhinestone Guy; Nestabilities; Scor-It. 2 Sketch Challenge Cards & A Sale! For this first card, I followed the latest Sketch For You To Try and the only change I made was to flip the sketch on its side. I had to get both of the clear birthday sets from The Cat's Pajamas because they're so cute, and I finally inked them up today! 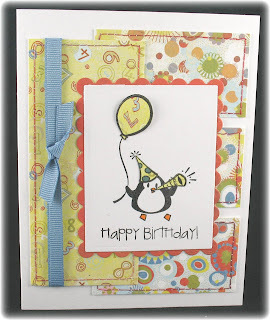 The penguin with balloon is from the "You Say It's Your Birthday" set and the sentiment is from the "Smells Like Cake" set. All the patterned paper is from the Basic Grey Cupcake pad and the grosgrain ribbon is from Stampin' Up! For my second card, I used the Little C's Weekly Challenge #12 sketch. The second part of the challenge was to use Anthony & Burt stamps, but since I didn't have any, I decided to not use any stamps at all! I knew I wanted to do a Halloween card, so I dug out some of this SUPER old Pebbles, Inc. paper and stickers and started playing. The spider, gravestone, and boo! are all stickers that are mounted on foam tape, and the sequins and brads are from Doodlebug. 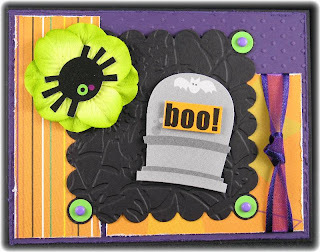 You can see I did some Cuttlebug embossing on the scalloped square and also the purple background. Please see this post on her blog for more details on the sale and blog candy! My Bellas have been feeling a bit neglected lately so I inked up Musicabella for the first time even though I've had her for a while. 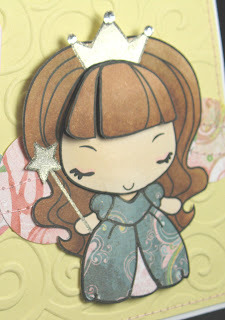 I paired her with the Allegro embossing folder and made my own sentiment from Papertrey's Simple Alphabet. Litte details: the bottom of her dress is popped up, her headband was colored with a Spica glitter pen, and I actually used a pin to make little dots of pearl paint for her necklace. 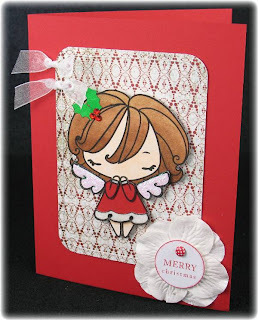 Other materials used: Berry Sorbet ribbon and cardstock - Papertrey Ink; patterned paper - Nana's Nursery Baby Girl paper pad; tag die - Spellbinders; Copic markers; silver cord - Stampin' Up! I got to play a little for World Cardmaking Day this past Saturday and was especially excited to do the challenges posted at Cornish Heritage Farms. I don't have any specifically Christmas sets from CHF, so I had to improvise just a little. The first challenge was to make a holiday card with snow. I immediately got an idea to do a snow covered branch so I pulled out The Landing Pad and also U R A Hoot! to have something to sit on the branch. [I copied a card I made a while ago. You can see it here.] I added a hat trimmed with felt and also the snow on the branch - liquid pearl paint covered with ultra fine glitter. The sentiment is also from the U R A Hoot! set (have I mentioned before how much I ADORE Kim Hughes' handwriting?!). You might not be able to tell, but the ric-rac is actually velvet. It's so pretty and adds such a nice texture and just a little goes a long way! The next challenge I took on was to make a holiday card that sparkles. 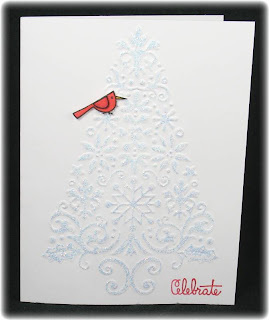 I recently got this Lace Tree embossing folder so I tried it out for this challenge. Unfortunately, it took me about 10 tries to get a really nice impression with no creasing around the edges of the tree. I finally figured out that I had to feed the folder through my Big Shot sideways! Anyway, after I got the perfect impression, I ran over all the raised portions with some Stickles and let it dry thoroughly. 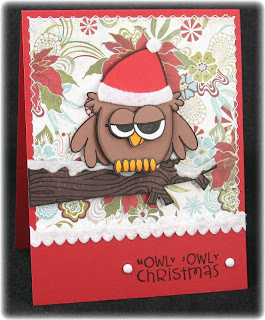 Then I added the little cardinal (from The Landing Pad set), and the sentiment (from the U R A Hoot! set). Thanks to CHF for these fun challenges, and an extra big thank you for the set I won from the festivities! Woohoo!! When I saw the Little C's Weekly Challenge #11 sketch, I knew I wanted to play and use my Angel Anya from Pink Poison, but then I saw that the second part of the challenge was to create a Christmas/Winter card. 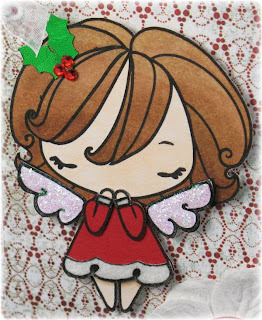 Well, I could just use Christmas/Winter papers, but then I thought that wasn't good enough, so I created Christmas Angel Anya! I wanted to use these little holly confetti leaves and itty bitty red rhinestones, but they wouldn't completely cover the bow in Anya's hair, so I cut a little piece of Eclipse Masking Tape and stuck it right to the rubber to omit the bow when I inked the image. Then I just peeled off the Eclipse bit and stamped. I made her a Mrs. Clause kind of outfit, complete with flocked cuffs and trim on the bottom of the dress (the dress idea came from my hubby! Thanks Hon!!). I also put Stickles on her wings and popped them up for extra dimension. You can see all the detail in this close-up shot. I kept the card pretty simple because I didn't want to take attention away from the adorable Anya! Hope you love her as much as I do! Other materials used: patterned paper - Basic Grey (Figgy Pudding line), sentiment (Mixed Messages set) and Pure Poppy ink - Papertrey Ink; Copic markers; brad - Queen & Co.; flowers - Prima; white organdy ribbon - Pink Hedgehog Papercrafts; rhinestones - the Rhinestone Guy; eyelets and confetti unknown.